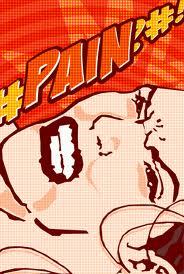 What Can Cymbalta Teach Us About Pain? 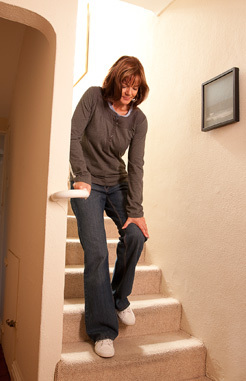 Cymbalta (duloxetine) had already been approved for diabetic neuropathy and fibromyalgia, two other pain syndromes. It’s a “dual-action” agent, i.e., an inhibitor of the reuptake of serotonin and norepinephrine. Other SNRIs include Effexor, Pristiq, and Savella. Of these, only Savella has a pain [fibromyalgia] indication. When you consider how common the complaint of “pain” is, this approval is a potential gold mine for Eli Lilly. Moreover, the vagueness of this complaint is also something they will likely capitalize upon. To be sure, there are distinct types of pain—e.g., neuropathic, visceral, musculoskeletal—and a proper pain workup can determine the exact nature of pain and guide the treatment accordingly. But in reality, overworked primary clinicians (not to mention psychiatrists, for whom hearing the word “pain” is often the extent of the physical exam) often hear the “pain” complaint and prescribe something the patient says they haven’t tried yet. 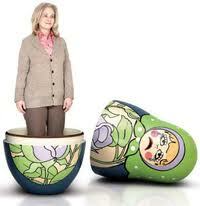 Cymbalta is looking to capture part of that market. But the more important question is: does it work? There does seem to be some decent evidence for Cymbalta’s effect in fibromyalgia and diabetic neuropathy in several outcome measures, and in a variety of 12-week trials summarized in a recent Cochrane review. In other words, it sounds like the FDA really wanted to get Cymbalta in the hands of more patients and more doctors. As much as I dislike the practice of prescribing drugs simply because they’re available and they might work, the truth of the matter is, this is surely how Cymbalta will be used. (In reality, it explains a lot of what we do in psychiatry, unfortunately.) But pain is a complex entity. We have to be certain not to jump to conclusions—like we frequently do in psychiatry—when/if we see a “success story” with Cymbalta. To the body, 60 mg of duloxetine is 60 mg of duloxetine, whether it’s being ingested for depression or for pain. 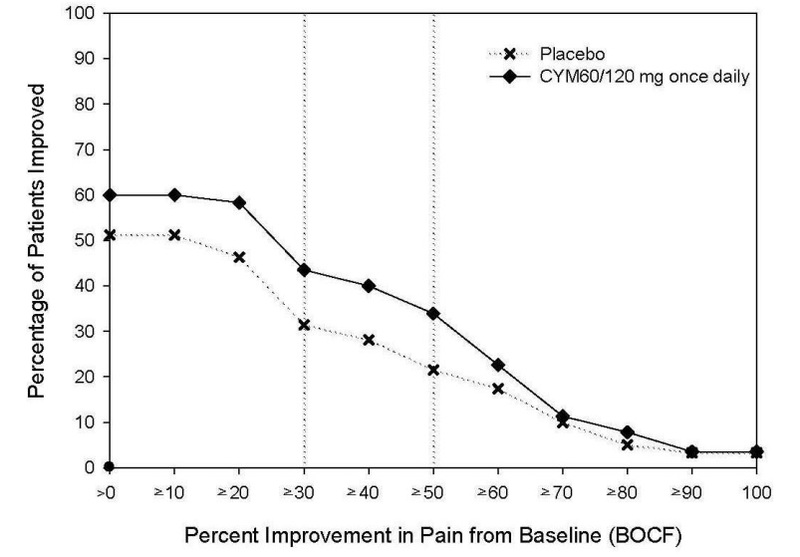 If a patient’s fibromyalgia or low back pain is miraculously “cured” by Cymbalta, there’s no a priori reason to think that it’s doing anything different in that person than what it does in a depressed patient (even though that is entirely conceivable). The same mechanism might be involved in both. Or maybe the medication is not the important thing. Maybe the patient’s perceived need for the medication matters more than the medication itself, and 60 mg of duloxetine for pain truly is different from 60 mg duloxetine for depression. However, if our explanations rely on perceptions and not biology, we’re entering the territory of the placebo effect, in which case we’re better off skipping duloxetine (and its side effect profile and high cost), and just using an actual placebo. Bottom line: We tend to lock ourselves into what we think we know about the biology of the condition we’re treating, whether pain, depression, schizophrenia, ADHD, or whatever. When we have medications with multiple indications, we often infer that the medication must work differently in each condition. Unless the doses are radically different (e.g., doxepin for sleep vs depression), this isn’t necessarily true. In fact, it may be more parsimonious to say that disorders are more fundamentally alike than they are different, or that our drugs are being used for their placebo effect. We can now add chronic pain to the long list of conditions responsive to psychoactive drugs. Perhaps it’s also time to start looking at pain disorders as variants of psychiatric disorders, or treating pain complaints as symptoms of mental disorders. Cymbalta’s foray into this field may be the first attempt to bridge this gap. Addendum: I had started this article before reading the PNAS article on antidepressants and NSAIDs, which I blogged about earlier this week. If the article’s conclusion (namely, that antidepressants lose their efficacy when given with pain relievers) is correct, this could have implications for Cymbalta’s use in chronic pain. Since chronic pain patients will most likely be taking regular analgesic medications in addition to Cymbalta, the efficacy of Cymbalta might be diminished. It will be interesting to see how this plays out. 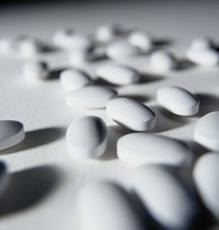 In a study published today, scientists at Rockefeller University proclaim that SSRI antidepressants (like Prozac and Celexa) may lose their efficacy when given with anti-inflammatory drugs like ibuprofen and aspirin. Considering the high prevalence of depression and the widespread use of both SSRIs and anti-inflammatory medications, this result is bound to receive much attention. As a matter of fact, it’s tantalizing to jump to the conclusion (as has been done in the Fox News and WSJ reports on this study) that the reason SSRIs may be so ineffective is because so many people with depression also use non-steroidal anti-inflammatory drugs (NSAIDs). By my read of the data, it may be a bit too early to draw this conclusion. 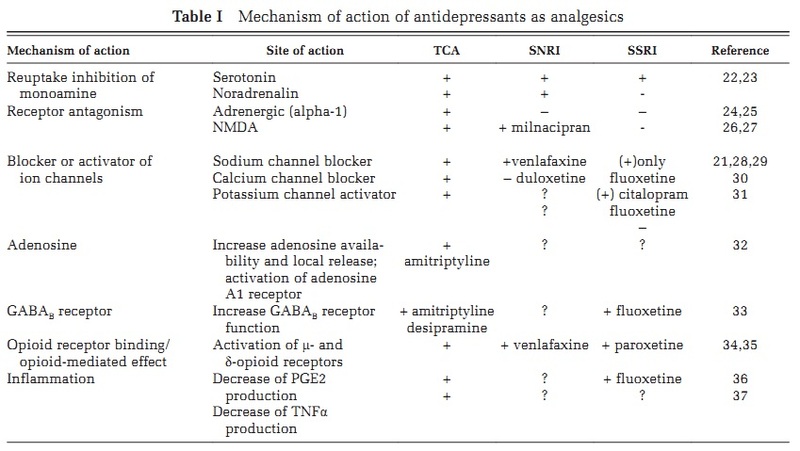 Nevertheless, the study, by Paul Greengard, Jennifer Warner-Schmidt, and their colleagues, and published online in the Proceedings of the National Academy of Sciences, does propose some interesting mechanisms by which anti-inflammatory agents may affect antidepressant action. The majority of the work was performed in mice, for which there are valid “models” of depression that are routinely used in preclinical studies. In past work, Greengard’s group has shown that the expression of a small protein called p11 (which is associated with the localization and function of serotonin receptors) is correlated with “antidepressant-like” responses in mice, and probably in humans, too. 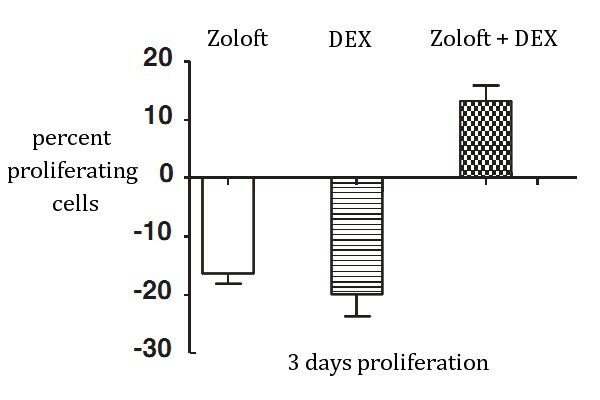 In the present study, they demonstrate that the antidepressants Prozac and Celexa cause an increase in expression of p11 in the frontal cortex of mice, and, moreover, that p11 expression is mediated by the ability of these antidepressants to cause elevations in interferon-gamma (IFN-γ) and tumor necrosis factor-alpha (TNF-α). 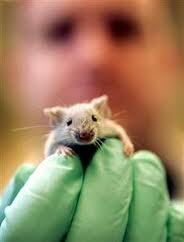 In other words, antidepressants enhance neural expression of these cytokines, which, in turn, increases p11 activity. However, when mice are given NSAIDs or an analgesic (i.e., ibuprofen, naproxen, aspirin, or Tylenol), this prevents the increase in p11, as well as the increase in IFN-γ and TNF-α. NSAIDs also prevent the “antidepressant-like” behavioral responses elicited by Celexa (as well as other antidepressants like Wellbutrin, Parnate, and TCAs) in mouse models of depression. The group went one step further and even created a p11 “knockout” mouse. These mice had no response to Celexa, nor did they have antidepressant-like responses to injections of IFN-γ or TNF-α. However, the p11 knockout mice did respond to desipramine, an antidepressant that works mainly on norepinephrine, thus emphasizing the significance of serotonin in the p11-mediated response. What does this mean for humans? To answer this question, the group analyzed data from STAR*D, a huge multicenter antidepressant trial. In the first stage of STAR*D, all patients (total of approximately 1500 individuals) took Celexa for a 12-week period. The remission rate for patients who took an NSAID at any time during this 12-week period was only 45%, while those who took no NSAID remitted at a rate of 55%. In my opinion, some of the mouse data need to be interpreted carefully. For instance, the mice received extremely high doses of NSAIDs (e.g., ibuprofen at 70 mg/kg/d, which corresponds to 4200 mg/d for a 60-kg man, or 21 Advil pills per day; similarly, the mice drinking aspirin received 210 mg/kg/d, or 12,600 mg = ~39 pills of regular-strength aspirin per day for a typical human). Also, in the behavioral studies the mice received NSAIDs for an entire week but received only a single injection of Celexa (20 mg/kg, or about 1200 mg, 60 pills) immediately before the behavioral experiments. The human data, of course, are equally suspect. Patients in the STAR*D study were counted as “NSAID users” if they described using NSAIDs even once in the first 12 weeks of the study. It’s hard to see how the use of ibuprofen once or twice in a three-month period might interfere with someone’s daily Celexa. (Not to mention the fact that the “remission” data from STAR*D have come under some scrutiny themselves – see here and here). 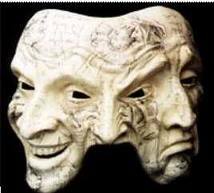 Moreover, as the authors point out, it’s quite likely that patients with more severe forms of depression also had concurrent pain syndromes and used NSAIDs more frequently. In other words, NSAID use might not attenuate SSRI activity, but may be a sign of depression that is more resistant to SSRIs. In the end, however, I find the study to be quite provocative. Certainly the correlation of antidepressant effect with expression of the p11 protein and with TNF-α and IFN-γ activity suggests a novel mechanism of antidepressant action—as well as new markers for antidepressant activity. Moreover, the potential roles of NSAIDs in reducing antidepressant effects (or, in some cases, enhancing these effects), need to be explored. But it raises even more unanswered questions. For one, how do we reconcile the fact that antidepressant effects are associated with increased TNF-α and IFN-γ activity in the brain, while increases in these cytokines in the periphery are thought to cause depression? Also, how can we explain the fact that other analgesic compounds, such as tramadol and buprenorphine, might actually have an antidepressant effect? 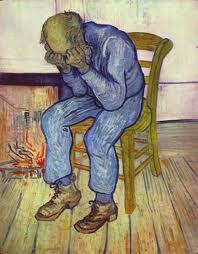 Finally, what does this mean for our treatment of pain symptoms in depression? Should we avoid SSRIs and use other types of antidepressants instead? Do NSAIDs inhibit the effects of SNRIs like Cymbalta, which has recently been FDA-approved for the treatment of chronic musculoskeletal pain (and whose users are most certainly also taking medications like NSAIDs)? 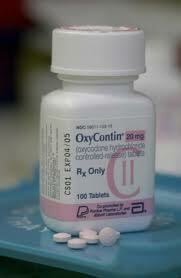 It should come as no surprise to anyone that prescription drug abuse is a serious problem. As if we needed any reminder, a flurry of articles recently hit the press, showing just how serious the problem is. Opioids (narcotic pain medications like Vicodin, Oxycontin, methadone, etc) are the most widely prescribed drugs in America, according to IMS and to a recent survey by the National Institute on Drug Abuse (NIDA), and prescriptions can lead to misuse, abuse, and dependence. Predictably, the government plans to get involved. As the New York Times reported earlier this week, the Obama administration wants to create legislation “requiring doctors to undergo training” before being permitted to prescribe opioid pain meds. Hearing “government” and “training” in the same sentence doesn’t exactly inspire confidence. What will the “training” consist of? An online seminar? A paper-and-pencil exam from the DEA? 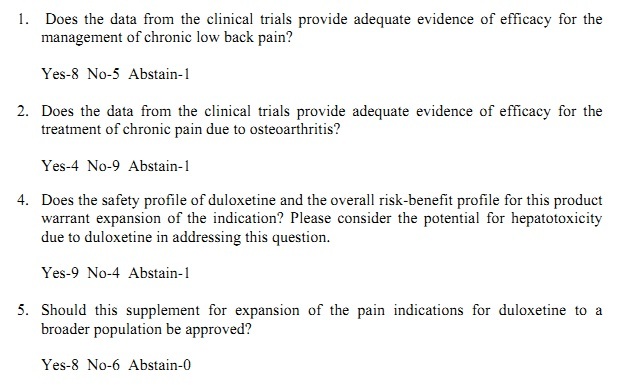 A separate section on “managing pain patients” in our Board Certification exams? With respect to the prevention of opioid abuse, I agree it’s a good idea for doctors to recognize the warning signs of addiction, to implement monitoring procedures (like random urine tests and treatment contracts), to deny early refills, and to inquire about other risk factors for abuse. Sadly, many doctors don’t take these measures and need encouragement to do so. But something tells me that simply providing government-mandated “prescriber education” won’t fix the problem. In my opinion, there are two other important issues to be addressed before this “training” will prove to be useful. The first is to get rid of existing inefficiencies. The truth is, most doctors already know the proper steps for prescribing potentially abusable opioids to pain patients. Some clinics (particularly pain clinics) follow these steps with all patients, simply as a matter of course. But in most treatment settings these steps are difficult to take. Regular urine monitoring is cumbersome and intrusive (although relatively inexpensive); generating a treatment contract takes time (although it’s arguably the most important “paperwork” of the appointment); and reviewing a patient’s full medication history is a challenge. Moreover, most of our non-patient-care resources and personnel are devoted to billing and data entry, rather than in these ancillary services that, in the long run, are far more important to cost-effective patient care. The second—and, in my opinion, more important—item is for doctors to understand what is the goal of treatment. 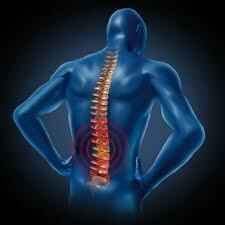 Not just “relief of pain,” but when (if at all) can the treatment be said to be complete? I’ve written about this before (see “When Does Treatment End?”), and I’m convinced it’s an important question not just in the treatment of pain but in the management of all conditions, even those we consider “chronic.” I believe that all prescribers need to ask themselves, “How long will the patient need this medication?” and engage the patient in this discussion, too. I frequently see patients who have been prescribed opioid pain medications, or benzodiazepines or stimulants (not to mention SSRIs or other psychiatric meds), who have no idea how long they’ll need to take them. They just “got a script.” And because these medications are highly reinforcing (they relieve pain or anxiety, and sometimes have a pleasant psychoactive effect as well), they’ll continue to ask for more. Why shouldn’t they, since they were never told they should stop? In any treatment setting, the patient and doctor should have a mutual understanding of the goals and likely duration of treatment. This plan can (and should) be flexible, but it should always have some realistic end point. Moreover, we should always measure our progress relative to that goal, rather than “kicking the can down the road” and letting someone else deal with the discontinuation of care later. I don’t think doctors should be in the business of denying care to patients, but if we’ve already had the discussion of when treatment might end, the issue of “no” has already been raised, and the patient understands this. How would this minimize the abuse of addictive medication? For one thing, it would limit access to the drug because we, a priori, are refusing to provide an endless supply. In turn, this helps the patient recognize that everything is being prescribed for a particular purpose, whether for the transient relief of post-op pain or the longer-term management of cancer pain. If and when other symptoms emerge, they need to be discussed and treated separately—or a more comprehensive treatment plan should be developed, if the evolving symptoms fit a characteristic pattern. I know this is a tall order, and these suggestions may be hard to implement in many of the places where narcotic prescribing is common (ERs, urgent care clinics, etc). But they are important measures to take. We need to take the steps we know we should take (rather than wait for the government to tell us to do so—because we know how that will turn out). And we need to think about patients as people with the power to heal, and plan for the healing process to take place, rather than give knee-jerk reactions (i.e., prescriptions) for symptoms. If we do this, patients will be less likely to take matters into their own hands and “self-medicate,” and the outcome of treatment will be better for all. Obesity-Related Anxiety: A Me-Too Disease? Psychiatry seems to have a strange fascination with labels. (I would say it has an obsession with labels, but then it would be labeled OCD.) We’re so concerned with what we call something that we sometimes ignore the real phenomena staring us in the face every day. Consider social anxiety disorder (SAD). Some have argued that this is simply a technical, high-falutin’ label for general shyness, which even “normal” people experience in varying degrees. There are indeed cases in which someone’s shyness can be horribly incapacitating—and these cases usually benefit from specialized treatment—but there also exists a broad gradient of social anxiety that we all experience. If I spend too much time worrying about whether the shy patient in my office meets specific criteria for SAD, I might lose sight of why he came to my office in the first place. So a news story this week caught my eye, with the headline “Obese People Can Suffer From Social Anxiety Due to Weight Alone.” To a non-psychiatrist, this statement probably seems self-evident: people who are overweight or obese (just like people with any other aspect of their physical appearance that makes them appear “different from normal”) might be anxious or uncomfortable in social settings, simply because of their weight. This discomfort doesn’t meet criteria for a DSM-IV diagnosis, though. (At this point, you might ask, but who cares? Good question—I’ll get to that below.) 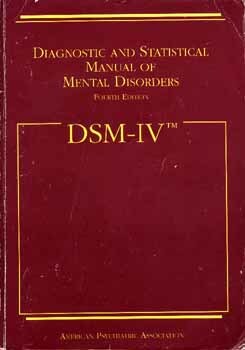 The DSM-IV specifies that the symptoms of social anxiety must be unrelated to any medical condition (of which obesity could be considered one). So if you’re overly self-conscious in social situations due to your weight, or due to an unsightly mole on your face, or due to a psoriasis flare-up, or because you’re a dwarf, sorry, you don’t “qualify” as SAD. An investigation of their methods, though, reveals that their key finding may have been a foregone conclusion from the start. Here’s what they did: They interviewed 1,800 people who were being evaluated for weight loss surgery. 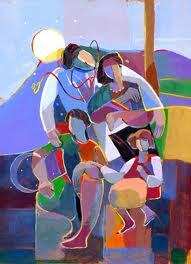 (A pre-op comprehensive psychiatric evaluation is often a requirement for bariatric surgery.) 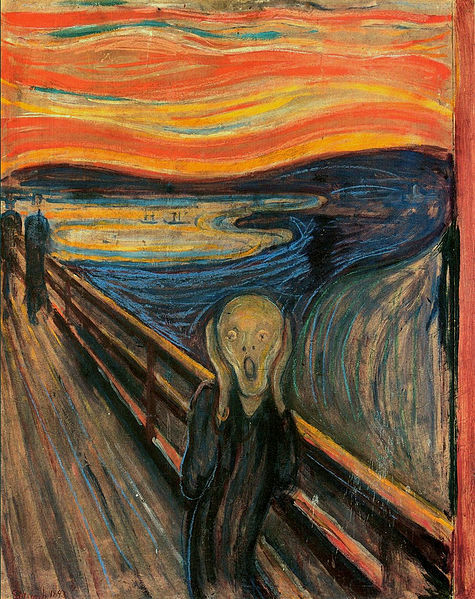 616 people had no psychiatric history whatsoever, while 135 of them had been diagnosed with SAD at some point in their lives. But then they found 40 additional people whom they labeled as having something they called “modified SAD,” or “clinically significant social anxiety … only related to weight concerns.” The paper demonstrates that this “modified SAD” group had psychosocial characteristics (like work/social impairment, past/current social functioning, etc) which were strikingly similar to patients with SAD. I don’t mean to be weigh too heavily (no pun intended) on study’s authors (for one thing, the lead author shared a draft of the article with me prior to publication). I know why articles like this are written; I’m aware that the medical exclusion has made it impossible for us to diagnose SAD in many people who actually have debilitating anxiety due to some obvious cause, like obesity or stuttering. And this is relevant because we have to give a DSM code in order to be paid for the services we provide. As with much in life, it’s often all about the money. But if that’s the only reason we’re squabbling over whether obesity-related anxiety deserves the DSM seal of approval, then I’m sorry, but it’s another example of psychiatrists and psychologists missing the point. Whether we call something SAD—or depression, or panic disorder, or ADHD, or bipolar disorder, or whatever—means less to the patient than what he or she actually experiences. Admittedly, we do have to give a “diagnosis” at some point, but we need to ensure our diagnoses don’t become so homogenized that we end up looking at all of our patients through the same lens. The 40 obese Rhode Islanders who are socially distressed due to their weight probably don’t care whether they’re labeled “SAD,” “modified SAD,” or anythingelse, they just want help. They want to feel better, and we owe it to them to get our heads out of our DSMs and back into the therapeutic setting where they belong. If you have even the slightest interest in the biology of depression (or if you’ve spent any time treating depression), you’ve heard about the connection between stress and depressive illness. There does seem to be a biological—maybe even a causative—link, and in many ways, this seems intuitive: Stressful situations make us feel sad, hopeless, helpless, etc—many of the features of major depression—and the physiological changes associated with stress probably increase the likelihood that we will, in fact, become clinically depressed. To cite a specific example, a steroid hormone called cortisol is elevated during stress, and—probably not coincidentally—is also usually elevated in depression. 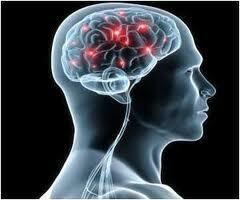 Some researchers have attempted to treat depression by blocking the effects of cortisol in the brain. Although we don’t (yet) treat depression this way, it is a tantalizing hypothesis, if for no reason other than the fact that it makes more intuitive sense than the “serotonin hypothesis” of depression, which has little evidence to back it up. A recent article in Molecular Psychiatry (pdf here) adds another wrinkle to the stress hormone/depression story. Researchers from King’s College London, led by Christoph Anacker, show that antidepressants actually promote the growth and development of new nerve cells in the hippocampus, and both processes depend on the stress hormone receptor (also known as the glucocorticoid receptor or GR). 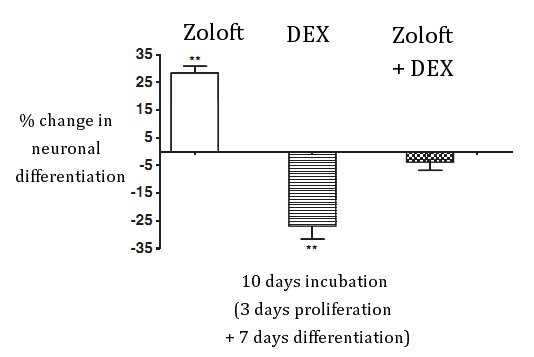 The take-home message here is that antidepressants and dexamethasone (i.e., stress hormones) are required for cell proliferation (first figure), but only antidepressants cause cell differentiation and maturation (second figure). Furthermore, both processes can be inhibited by RU486, a stress hormone antagonist (third figure). All in all, this research makes antidepressants look “good.” (Incidentally, the researchers also got the same results with amitripytline and clomipramine, two tricyclic antidepressants, so the effect is not unique to SSRIs like Zoloft.) 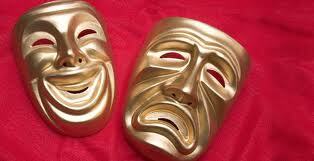 However, it raises serious questions about the relationship between stress hormones and depression. If antidepressants work by promoting the growth and development of hippocampal neurons, then this research also says that stress hormones (like dexamethasone) might be required, too—at least for part of this process (i.e., they’re required for growth/proliferation, but not for differentiation). This also raises questions about the effects of RU486. Readers may recall the enthusiasm surrounding RU486 a few years ago as a potential treatment for psychotic depression, promoted by Alan Schatzberg and his colleagues at Corcept Pharmaceuticals. Their argument (a convincing one, at the time) was that if we could block the unusually high levels of cortisol seen in severe, psychotic depression, we might treat the disease more effectively. However, clinical trials of their drug Corlux (= RU486) were unsuccessful. 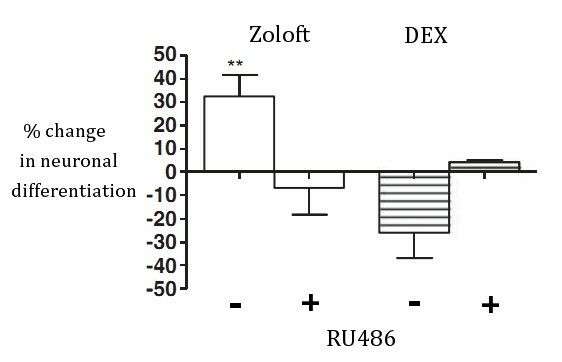 The experiments in this paper show one possible explanation why: Instead of simply blocking stress hormones, RU486 blocks the stress hormone receptor, which seems to be the key intermediary for the positive effects of antidepressants (see the third figure). The Big Picture: I’m well aware that this is how science progresses: we continually refine our hypotheses as we collect new data, and sometimes we learn how medications work only after we’ve been using them successfully for many years. 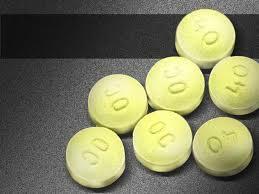 (How long did it take to learn the precise mechanism of salicylic acid, also known as aspirin? More than two millennia, at least.) But here we have a case in which antidepressants seem to work in a fashion that is so different from what we originally thought (incidentally, the word “serotonin” is used only three times in their 13-page article!!). 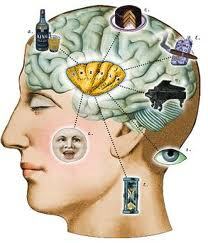 Moreover, the new mechanism (making new brain cells!!) is quite significant. And the involvement of stress hormones in this new mechanism doesn’t seem very intuitive or “clean” either. It makes me wonder (yet again) what the heck these drugs are doing. I’m not suggesting we call a moratorium on the further use of antidepressants until we learn exactly how they work, but I do suggest that we practice a bit of caution when using them. At the very least, we need to change our “models” of depression. Fast. Overall, I’m glad this research is being done so that we can learn more about the mechanisms of antidepressant action (and develop new, more specific ones… maybe ones that target the glucocorticoid receptor). In the meantime, we ought to pause and recognize that what we think we’re doing may be entirely wrong. Practicing a little humility is good every once in a while, even especially for a psychopharmacologist. But others were professional and well-reasoned, and emphasized the true need for a medication like Silenor: an effective sleeping medication with little daytime “hangover” effect and few other adverse effects. Some comments (which you can read on my page) were from users who seem to have had good experiences with Silenor. Assuming these comments are truly from satisfied users of Silenor (a big assumption, as this is still the internet!! ), I started to think about something that every psychopharmacologist (including myself) struggles with on a regular basis: namely, the fact that some people respond exactly the way we expect them to respond, based on our biochemical hypotheses, whereas others have completely different responses. Or to put it another way, our models—and the research that is done to support those models—often have very little predictive value when you translate this information to the real world. And nowhere is this more apparent than in psychiatry. In medical school and residency, I was a bit of a pharmacology nut. (I’d use the word “wonk,” but I always thought that word was reserved for “insiders,” of which I am decidedly not one.) Pharmacology, indeed, is a fascinating subject. 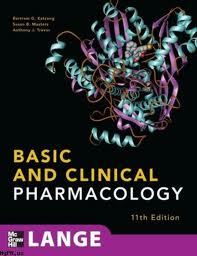 Bioavailability, pharmacokinetics, receptor-binding affinities, metabolism, drug-drug interactions—each of these is a discipline unto itself, with its own language, experimental methods, and predictive power. 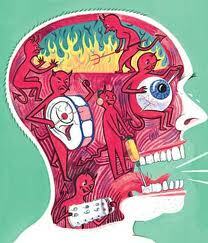 In psychiatry, the intricacies of pharmacology become even more elaborate. There’s a lot of research (not to mention pages and pages of textbook chapters and lots of drug company promotional materials) describing the details drug dosing regimens, drug-drug interactions, receptor-binding affinities and their putative relationships with symptom profiles, etc. Just to pick out some familiar examples, the dosing strategies for Seroquel XR and Abilify seem quite detailed indeed: the predicted effects of very low doses are thought to be different from “mid-range” doses, which are different still from higher doses. And so on. The truth of the matter is, these subtleties often make very little difference in the real world. That’s not to say that the theories of action are wrong. (Maybe Seroquel XR really is an effective norepinephrine reuptake inhibitor at moderate concentrations.) Instead, it speaks to the enormous variability among human beings, and the fact that our real-world patients sometimes don’t fit the models we construct for them. My response to Dr Scharf is: OK. But what do patients actually experience? In fact, I would take issue with the comment that “there is little doubt as to next day effects” because I have patients taking 25 or 50 mg doxepin who do not report next day effects (and some MDs who responded to my first post said the same thing). Or if they do experience next-day effects, perhaps they’re not bothersome and they’re only apparent upon questioning. In other words, the numbers predict one thing, but what do patients report? 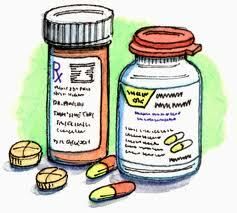 The human body is a laboratory, and each drug we prescribe is an “experiment” in that laboratory. 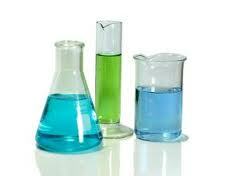 For many people, however, the laboratory doesn’t resemble the pristine one in the clinical trials. 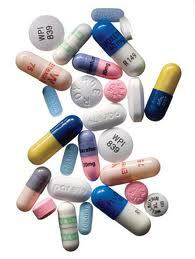 People take extra doses of drugs, or skip doses altogether. They’ll take drugs at different times than prescribed. Once inside the body (and even this process is highly variable), the drugs are metabolized differently, or they’ll react with existing chemicals (foods, other drugs, neurotransmitter receptors, different polymorphisms of receptors, etc) in ways that we can only begin to understand, due to this substantial combinatorial complexity. Unfortunately (or fortunately, depending on how you look at it), bringing a drug like Silenor to market requires that the molecule be tested in very rigorous (and therefore “pristine”) conditions in both animals and humans. Dr Scharf and his colleagues have done painstaking work in showing precisely how drugs like Silenor work—ideally. But in the real world, “all bets are off,” as they say. Patients taking 25 or 50 mg doxepin often feel “just fine” and have no QT prolongation or weight gain, regardless of what the clinical trials would predict. Similarly, patients taking 6 mg might report absolutely no benefit at all. I should emphasize, I do NOT advocate reckless prescribing—e.g., giving “PRN” prescriptions to everyone and ask them to adjust the dose according to what makes them feel better, or prescribing without consideration of all of the potential biological effects of our drugs. We clinicians do have a responsibility to look out for drug-drug interactions (which can be lethal at times), to check drug levels (for certain medications, even regardless of clinical response) and to prescribe potentially abusable medications cautiously. Knowledge of all of the principles of pharmacology is necessary to ensure the safe use of medications, and taking advantage of this knowledge can improve patient outcomes. But in the real world it is all about the patient, and if they “do well” on doses of medications that seem to make no sense at all (and all safety measures are in place), isn’t that what counts most? And, moreover, shouldn’t that lead us to question the hypotheses that led us to those doses in the first place? You are currently browsing the Thought Broadcast blog archives for April, 2011.